Situated in a rural location, this hotel is 1.9 mi (3 km) from John Blue House and Heritage Center and within 20 mi (32 km) of Deercroft Golf Course and National Railroad Museum. Hamlet Passenger Depot and Marlboro County Historical Museum are also within 20 mi (32 km). 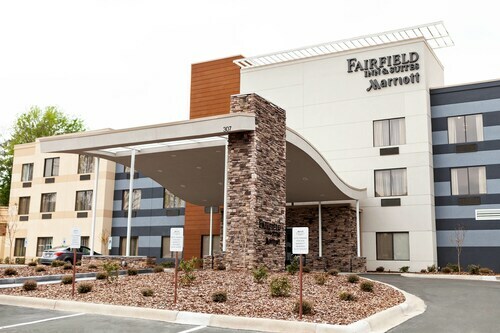 Located in the heart of Rockingham, this hotel is 6.1 mi (9.9 km) from National Railroad Museum and within 12 mi (20 km) of Rockingham Speedway and Hamlet Passenger Depot. The Rankin Museum of American Heritage is 9.8 mi (15.7 km) away. 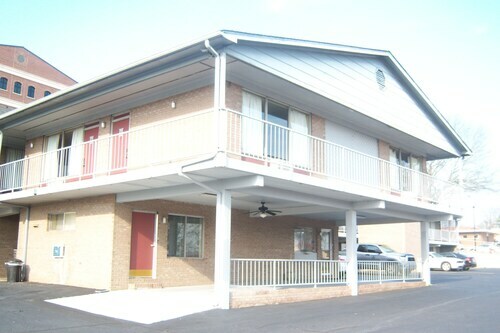 Situated in a shopping district, this hotel is 3.2 mi (5.2 km) from National Railroad Museum and within 12 mi (20 km) of Rockingham Speedway and Hamlet Passenger Depot. The Rankin Museum of American Heritage and John Blue House and Heritage Center are also within 20 mi (32 km). 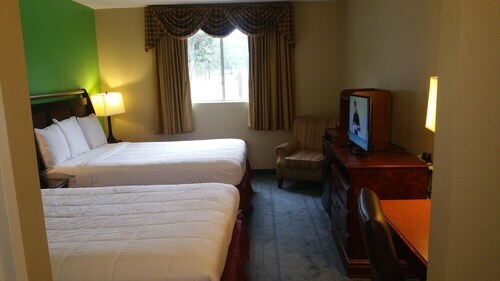 Situated in Laurinburg, this hotel is 1.3 mi (2.1 km) from John Blue House and Heritage Center and within 20 mi (32 km) of Deercroft Golf Course and National Railroad Museum. Hamlet Passenger Depot and Marlboro County Historical Museum are also within 20 mi (32 km). How Much is a Hotel Room in Hamlet? Hotels in Hamlet start at $85 per night. Prices and availability subject to change. Additional terms may apply. Planning a trip and searching for accommodation amongst the locals in Hamlet? You can find 5 hotels, apartments and other accommodation options within 6 miles (10 kilometers) of the center of town. Accommodation options that can be found within a short distance of Hamlet include the Holiday Inn Express Hotel & Suites Rockingham and Comfort Suites Rockingham. 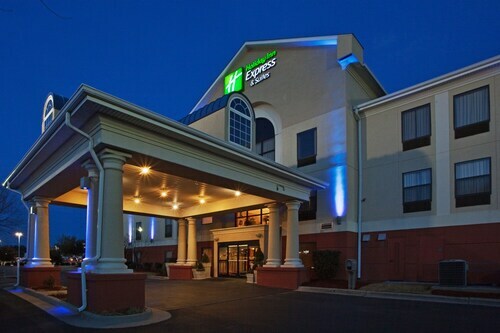 You could also try the Holiday Inn Express Hotel & Suites Laurinburg or the Comfort Inn Laurinburg. 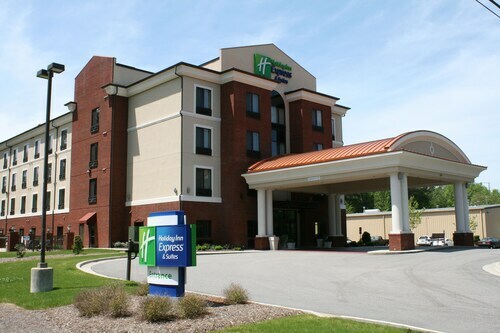 The Holiday Inn Express Hotel & Suites Laurinburg is located 14 miles (23 kilometers) from the main part of Hamlet. 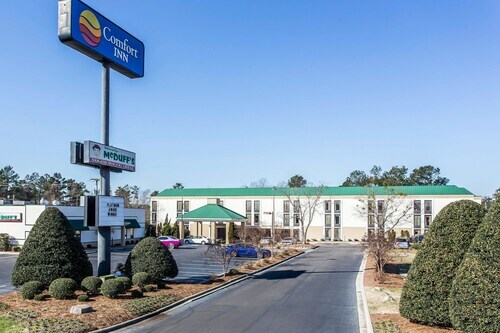 The Comfort Inn Laurinburg, is situated 14 miles (22 kilometers) away. Other hotels and apartment options include the Hampton Inn Laurinburg and the Quality Inn & Suites Rockingham. Once you have enjoyed Hamlet, you should leave time to explore the diverse activities of the Eastern Piedmont area. Get ready to discover the sights of Eastern Piedmont's tablelands. On top of that, venture to a few of its historic mansions. Fun-loving travelers can also get into cycling, shore fishing and swimming in the region. Prior to departing from Rockingham, you should make sure you get down to watch a thrilling game. Visit McCrary Park, which you can find north of Hamlet. Visitors who are thinking about staying close by, book a room in the Hampton Inn Asheboro or Holiday Inn Express & Suites Asheboro. Located 45 miles (73 kilometers) away from the downtown area of Hamlet is Florence Regional Airport. Stay nearby at Hotel Florence, an Ascend Hotel Collection Member or Motel 6 Florence Historic Downtown. Check was great super friendly, even called up to make sure everything was good in the room! Great service! Does look like much, but bed was comfortable, room big, nice flat screen TV. No shampoo, but clean bathrooms. The 5am nearby train horn means I didn't need to set my alarm. Don't expect fancy breakfast, eat down street at Buiscitville or Waffle House. All in all, okay value for price . 2.0 New hotel, very poor construction. This is a fairly new hotel. It was built with wood floor trusses causing squeaking/creaking every step. The guest in the room above me were "heavy" walkers and must have traveled at least a mile getting ready in the morning. The guests in the room next to me partied until one a.m. and the walls seem to have no insulation/sound barrier. Over all very poor construction. Even the doors closed with a very large bang, I don't see how any one could sleep under these conditions. The guy at the desk was great but we only had one towel. There are no mini fridges or microwaves in the room although there is a dirty one in the hall on each floor. Our toilet chain was messed up so you had to reach in the tank and move it after each flush. The pool was not open because the inspector hadn't come yet.